The FA Cup, at last! As football became more popular in the industrial towns of northern and central England, the clubs realised the need for an organized league. When The Football League was formed in 1888, Everton were one of the 12 founding members. Everton's first league match was played against Accrington and Everton won by 2-1. G Fleming scored both goals. Attendance was over 10,000. 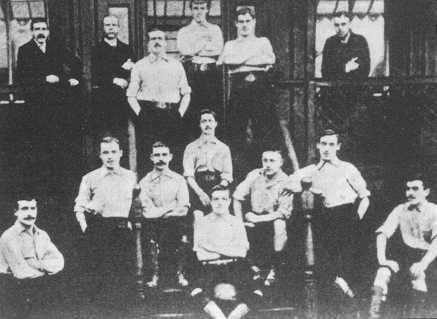 After the "undefeatable" Preston North End had won the first two championships, Everton grabbed the third in 1890-91 over a series of 22 matches. The influential players were half-back Johnny Holt ("The Little Devil"); intelligent light-weight inside-left, Edgar Chadwick; and the never-say-die outside-left, Alfred Milward. Chadwick and Milward formed perhaps the most lethal left-side partnership of their era. In addition, there was the top scorer, Fred Geary (center-forward). All of these were capped in the English national team of the period. Of the other good players, two deserve mention, although they only played one full season with Everton. In the League's first season, Everton had perhaps the best defender of his era, Nick Ross, who died of a lung disease when he was 31. The other outstanding player was Jack Southworth, who joined Everton a few years after the first championship. Southworth still holds one club record Everton: in the 1893-94 season he scored six goals in a home match against West Bromwich, and 16 goals in seven matches. There was a radical change in the club's history in summer 1892, when the team moved away from Anfield ... to Goodison Park. The creation of the Football League and Everton's success in it soon had some undesirable side effects. John Houlding had bought Anfield and he more than doubled the rent in a few years. In early 1892, the resentful Everton board, lead by George Mahon, decided to find a new ground for the club. Mahon already had a reservation for a field in the northern part of Stanley Park, near Goodison Road, called Mere Green Field, which was described as a "howling desert". The "rebels" were determined, though; they cleared the new area and built fabulous terraces for their new home, giving it the name, Goodison Park, leaving a remnant of the club at Anfield. Part of the purchasing and building expenses were paid by a wealthy gentleman called Dr James C Baxter. The new ground was inaugurated on August 24, 1892. The ceremonies were led by George Mahon, who had been elected as the new chairman. Also present was Lord Kinnaird, a 9-times FA Cup finalist and the chairman of the FA. The attendance was 12,000, although no football was played! The first match at Goodison was a friendly  Bolton were beaten 4-2. The first League match was played the next day, resulting in a 2-2 draw against Nottingham. To show that Goodison Park has always been one of the best grounds in the country, Goodison was chosen to host the FA Cup final in 1894. Notts County beat Bolton 4-1 in this match. During the move to Goodison, Everton also became a limited company, with an original issue of 500 one-pound shares. In the beginning it looked like there would be two Everton's in the city, but the FA ordered that the majority who had moved to Goodison Park would be allowed to keep the name, Everton. So Houlding and the rest who stayed at Anfield formed Liverpool FC. Liverpool's first captain was Andrew Hannah, a champion with Everton in 1891. So this split is the foundation for one of the biggest and most traditional rivalries in football. The first Merseyside derbies were played in the 1894-95 season, when Everton won the first match at Goodison, in front of a 44,000 crowd (the then league record), 3-0 and then drawing 2-2 at Anfield with a crowd of 26,000. The 1894-95 season, not unlike the 1994-95 season (! ), brought a few unpleasant events. After one Everton League match, club officials found out that some of the revenue had disappeared. This treason lead to a court case. Shortly after this, a match had to be abandoned due to poor weather and, even though the crowd was promised free tickets to the replay, a part of the crowd started rioting. The police force at the ground had to call for reinforcements before the riot was brought under control. Mahon and four other board members resigned because of administrative problems, but something good did come out of it: one of the new board members was William C Cuff, who would lead Everton for over 50 years, as a board member, secretary, and finally between the wars, as the chairman. In 1938, Cuff was selected as the chairman of the FA. Everton had several kits and nicknames during the first decades. The original blue and white stripes were soon transformed to a mess when the new players wore their old team's shirts. Soon it was decided in the name of uniformity, that the shirts would be colored black, to save expenses! During this time, Everton were nicknamed The Black Watch, after the famous army brigade. When the club moved to Goodison, they played in salmon stripes with blue shorts (this is the origin of the Centenary celebration kit), and later still, ruby shirts with blue trimmings and dark blue shorts. The famous royal blue jerseys with white shorts were first used in 1901-02. This is of course the origin for the nickname "The Blues". In the early days, Everton often trained late into the night, so they were nicknamed "The Moonlight Dribblers", or so it is believed. The scientific style lead to the name "The School of Science". After Everton moved to Goodison, they picked up another nickname, "The Toffees" or "The Toffeemen". There are two versions to explain how this name was adopted: the better known is that, in those days, a Mrs Noblett had a candy store near Goodison called Mother Noblett's Toffee Shop, where she advertised and sold her tasty merchandise on match days. Another reason might be that there was a house called Ye Anciente Everton Toffee House near the Queen's Head hotel. The word "toffee" also referred to Irishmen, of which there was a large population in the Liverpool area at the turn of the century. Everton lost their first two FA Cup finals. In 1893, Everton were in the final for the first time after they had beaten Preston in the semi-final 2-1. In the final, at Fallowfield in Manchester, Wolverhampton beat the Toffeemen 1-0 when the Everton keeper couldn't catch a long looping shot by Harry Allen "because he was blinded by the sun". In 1897, Everton got to the final at Crystal Palace in London after they had beaten Derby in the semi-final 3-2. In the final itself, which was considered as the best and most exiting of the finals so far, Aston Villa came out the winners by 3-2. Everton goals were scored by John Bell, the Scottish International, who was a masterful dribbler, and was considered Man of the Match despite the defeat, and half-back Robert "Dickie" Boyle, a Scotsman too, who was used to scoring. It was third time lucky for Everton. In the semi-final in 1906 Everton beat their dear rivals, and the next champions, Liverpool 2-0. In the final, Everton defeated Newcastle 1-0 with a goal from Alex "Sandy" Young (no relation to Alex "The Golden Vision" Young of the 1960s) at Crystal Palace. Everton deserved the win, because they were clearly the better side, especially in the second half. Sandy Young had already scored an offside goal before he got the winner. From Liverpool's Lime Street station, the Everton cup heroes were taken to Goodison Park in a four-in-hand carriage with the "supercaptain" Jack Taylor showing the Cup to the celebrating crowd. 60 years later the history repeated itself, when Everton were greeted as the Cup winners at Lime Street, and paraded the Cup form an open-topped bus, while Liverpool won the championship. The Blues were in the Cup Final the following year, too, but this time they lost to Sheffield Wednesday 1-2 � their revenge came 59 years later! Everton's goal in the 1907 final was scored by right winger Jack Sharp, who created the winning goal the previous year with his dribbling and passing. In those days, Sharp was the most influential player alongside Young, as he represented England both in football and cricket! Sharp became one of the Everton executives after his playing career, as did his son, Jack C Sharp, in the 1960s and 1970s. Jack Sharp started a successful sportswear shop, which advertised in the Everton match programmes of the 1970s. Everyone who witnessed the glorious days of the 1980s, knows what the name Sharp meant at Goodison, although Graeme Sharp isn't related to this Jack Sharp. One player who played for Everton in both these early cup finals was Harold Hardman. The small-sized Hardman was an amateur, and one of only three amateurs who have won a cup winner's medal this century (the others are Manchester City's Ashworth in 1904, and Hunt for Wolves in 1908). Hardman won Olympic gold with England in 1908. Later, Hardman was on Manchester United's board for 50 years, the last 17 as Chairman. Everton almost won the double the year before the cup victory, in 1904-05, but some unfortunate events prevented Everton from doing this. In November 1904, Everton played an away match against Woolwich Arsenal, and were leading 3-1 when, with just 15 minutes remaining, the match was abandoned. The match was replayed later from the start (in April 1905) and Everton lost 1-2. The result meant second place in the League, just a point adrift of the champions Newcastle! In the FA Cup semi-final, Everton lost the replay 1-2 to Aston Villa, who won the final against Newcastle 2-0. The double was so close, but so far away, just like 81 years later (1986). During 1908-09 season, Everton's new sensation, center-forward Bertie Freeman scored a new League record of 36 goals in 38 matches (Freeman played 37). Freeman's record is even more valuable, as the offside rule was such that there had to be three players between the forward and the goal when the ball is passed forward (one of these was usually the keeper). This was changed to two in 1925. 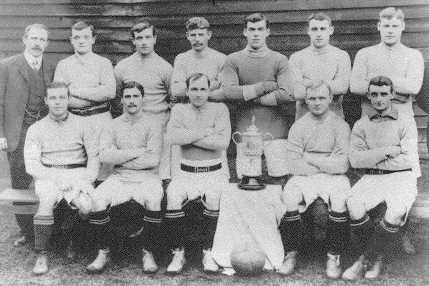 Finally, 10 years after the near miss and 24 years after their first championship, Everton won their second in 1914-15. The championship, that preceded the break caused by World War I, was won with a one-point margin ahead of Oldham. Important players in the team were defender and captain Jimmy Galt and the tough half-back Harry Makepeace who, along with Jack Sharp, had the rare chance of having English caps in both football and cricket. Makepeace also played in the 1906 and 1907 Cup Finals along with Sharp and Hardman. Makepeace, who was said to be a man of few words, was with the club for 13 years, playing 284 league and 52 cup matches for Everton, and scoring 16 league and 7 cup goals. His Everton career might have been longer but for the war. Makepeace was the Everton trainer for a while after the war. Most of the headlines were still grabbed by the right winger Sam Chedgzoy and his fantastic crosses to center-forward Bobby Parker, who scored 36 goals, equaling Freeman's record. Chedgzoy, who was a stunning dribbler, played for the Toffees halfway into the twenties and was a regular in the English team. In Autumn 1924 in a match at White Hart Lane, Chedgzoy passed the ball to himself from a corner, dribbled it towards the Tottenham goal and scored a solo goal! The goal was disallowed and eventually lead to a change in the rule. 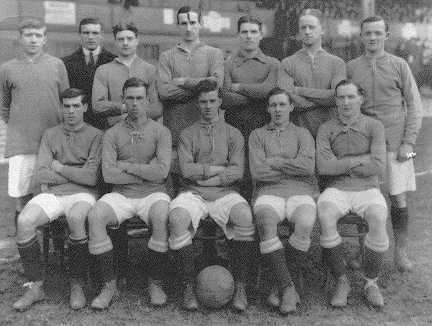 Everton were one of the big clubs before World War I, but not the most successful. Other big clubs of that era were Aston Villa, Sunderland, Preston and Newcastle. But Everton hold the dubious distinction of keeping the League title for five years before they had to surrender it to Liverpool, who won the first championship after the war.